What do top manufacturing brands of Automated CD/DVD Printers and Automated Inkjet CD DVD Printers such as Microboards, Primera, Microtech and Teac have in common? 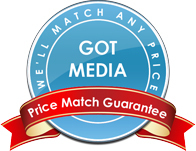 They can all be found right here at GotMedia.com for excellent prices. Below is a selected range of our top selling automated disc printers with capacities from 20 to over 100 discs printed at a time; automated disc printers that give you or your business a fast low cost way to print directly on your CDs, DVDs & Blu-ray disc media. Printing with a fully integrated automated inkjet or thermal CD/DVD printer leaves you with time to focus on your business rather than printing one disc at a time. Be sure to take a look at our excellent range of inkjet printable DVD-R media and thermal printable DVD-R media while you're here. We're always updating our product line here in Orange County, CA so if you are looking for an automated disc printer with higher capacities, please don't hesitate to give us a call! Epson's DiscProducer has been making quite a splash since it's debut at CES 2008 and is getting great reviews from users. Built with Epson’s advanced robotics and printing technologies, the compact, professional CD DVD disc publisher has all the features you need to get the job done. It is designed to burn and print up to 100 customized CDs or DVDs on demand. Bravo SE automatically prints full-color, 4800 dpi images directly onto the surface of CDs and DVDs. The Bravo SE AutoPrinter produces gorgeous, full-color CDs and DVDs in jobs of up to 20 discs at a time. It automatically feeds discs into and out of the printer. Primera Bravo 4100 Auto Printer are easily the fastest desktop disc printers in the world today. At just six(6) seconds to print each disc with 100% coverage in near-perfect quality, you'll be stunned at how fast your jobs will now get completed.